The flag represents Mississippi's place as the 20th state. Mississippi became the 20th state in 1817. The large flag’s many holes and frayed edges require immediate attention. Though the red and blue colors remain vibrant, the fragile gauze fabric is delicate to the touch, and the hand-sewn white stars have discolored over time. 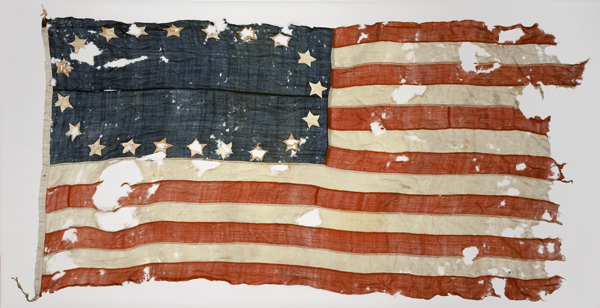 The historic flag was discovered in an antique shop in Massachusetts, and acquired by MDAH in 2001. The flag was originally owned by a Captain Weston of Marshfield, Massachusetts, and flew on one of his ships. 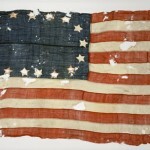 Textile Preservation Associates, flag conservation specialists in West Virginia, will do the work. The business recently did conservation work on the 11th Mississippi Cavalry Civil War flag for the Department of Archives and History. The conservation process will include vacuuming, humidification (wetting the fabric to release the dirt), and flattening the textile. The flag will then be pressure-mounted into a frame. The flag is the official symbol of the Bicentennial Commission. Once it has been restored, the banner will travel the state in anticipation of Mississippi’s bicentennial celebration and the opening of the new Museum of Mississippi History, where the Twenty-Star Flag will be on permanent display. For now the flag remains in storage until restoration can begin. The estimated cost to preserve and exhibit the flag is $50,000. Contributions will ensure that this irreplaceable Mississippi artifact is protected for generations to come. To make a donation, or for more information about the project, visit www.mshistory.net or call 601-576-6855. This entry was posted on Thursday, July 7th, 2011 at 7:40 am	and tagged with 20-star flag, flag conservation, Mississippi Bicentennial and posted in General Info. You can follow any responses to this entry through the RSS 2.0 feed. Your blog site was tweeted by a friend the other day. Decided I’d check it out. Best decision ever. Super-Duper website! I am loving it!! Will arrive back again – taking you feeds also, Thanks. Cool post, keep up the great work! Great post! Looking forward to more posting from you. Thank you. I agree with your Rare 20-Star Flag to be Preserved | Foundation for Mississippi History, wonderful post. I agree with your Rare 20-Star Flag to be Preserved | Foundation for Mississippi History, excellent post. Great – I should certainly say I’m impressed with your site. I had no trouble navigating through all the tabs as well as related info. It ended up being truly easy to access. Good job. I desire to make use of some of the content on my weblog. Naturally I’ll offer you a hyperlink in my internet blog. Thanks for sharing. Do you mind if I quote a couple of your articles as long as I offer credit and sources back to your blog? My web site is in the really identical area of interest as yours and my users would truly benefit from a great deal of the information you present here. Please let me know if this okay with you. Regards! Thanks for spending the time to discuss this, I feel strongly about it and love reading more on this topic. If possible, as you grow to be an expert, would you mind updating your weblog with more details? Hi there! I simply want to give a huge thumbs up for the nice data you have here on this post. I might be coming again to your blog soon. I like Your Article about Rare 20-Star Flag to be Preserved | Foundation for Mississippi History Perfect just what I was searching for! . Hello, I needed to ask you something. Is this a wordpress webpage? We’re wondering about moving my weblog from Blogger to wordpress, you think this can be achievable? In addition did you set up this unique theme by yourself some how? Thank you for your assistance! Your blog was tweeted by a friend last night. Decided I’d take a look. Best decision ever. Hi, I need to spend some time learning more about topics like this. Thanks for fantastic info I was looking for this info for one of my school assigments. I will com back to enjoy more. Thank you, very much. I like Your Article about Rare 20-Star Flag to be Preserved | Foundation for Mississippi History Perfect just what I was looking for! . Hello! I just would like to give an enormous thumbs up for the great info you have right here on this post. I shall be coming back to your weblog soon. Appreciating the commitment you put into your blog and detailed information you offer. It’s good to come across a blog every once in a while that isn’t the same unwanted rehashed information. Great read! I’ve saved your site and I’m adding your RSS feeds to my Google account. Howdy! I liked your article but I am genuinely not getting the concept. Is it a common style or something? Take care and keep up posting! Some of these replies on this post look like garbage; You should filter them out. I simply want to mention I am just beginner to blogging and honestly savored your web blog. Very likely I’m going to bookmark your blog . You really come with impressive articles. Thanks a lot for sharing your blog site. Thanks, I have been looking for info about this subject matter for ages and yours is the best I’ve located so far. thank you for this post I was looking for that..
Hey! I simply would like to give a huge thumbs up for the good info you have right here on this post. I shall be coming back to your blog soon. I must examine with you here, which isn’t something I often do! I take pleasure in reading a blog that can make folks think. Also, thanks for allowing me to comment! Nice post. I learn something on different blogs everyday. It can always be stimulating to read content material from other writers and observe a bit something from their blog. Hi, sehr interessanter Artikel. Ich beschäftige mich mit dem selben Thema und warte auf mehr Artikel zu dem Thema. When I originally commented I clicked the -Notify me when new comments are added- checkbox and now every time a remark is added I get four emails with the identical comment. Is there any manner you can remove me from that service? Thanks! Not often do I encounter a blog that’s both educated and entertaining, and let me inform you, you could have hit the nail on the head. Your idea is excellent; the problem is something that not enough people are speaking intelligently about. I’m very joyful that I stumbled throughout this in my quest for info relating to this. Cool blog! Is your theme custom made or did you download it from somewhere? A theme like yours with a few simple tweeks would really make my blog shine. Please let me know where you got your design. I agree with your Rare 20-Star Flag to be Preserved | Foundation for Mississippi History, fantastic post. Just wanted to say truly well carried out. Superb job. Very nice style and fantastic articles, absolutely nothing else we need :D.
Very good written story. It will be beneficial to anyone who employess it, as well as me. Keep doing what you are doing – can’r wait to read more posts. I found this post earlier today while in the office. Very educational. Sent the link to myself and will probably bookmark it when I make it home. Thank you for sharing superb informations. Your web-site is so cool. I’m impressed by the details that you’ve on this blog. It reveals how nicely you understand this subject. Bookmarked this website page, will come back for more articles. You, my pal, ROCK! I found just the information I already searched all over the place and simply couldn’t come across. What an ideal web site. I merely wanted to write down a quick message to express gratitude to you for the marvelous concepts you are placing on this website. My rather long internet look up has now been paid with pleasant points to write about with my great friends. I d claim that we website visitors are unequivocally lucky to dwell in a truly good web site with extremely many wonderful people with insightful guidelines. I feel truly happy to have seen your web site and look forward to tons of much more exciting moments reading here. Thanks a great deal once once more for a great deal of things. Many thanks for being our lecturer on this subject. I enjoyed your article quite definitely and most of all enjoyed reading how you handled the areas I widely known as controversial. You’re always really kind towards readers really like me and assist me to in my everyday living. Thank you. Terrific. I really loved your column. I genuinely desire reading additional blog entries from you. I additionally appreciate the area for concise comments. A great blog plus fascinating comments is fantastic to come upon in any exposition. Your story has the whole caboodle. It is seldom that I happen upon such fantastic instruction. I stumbled upon this post earlier today while at work. Very useful. Sent the url to myself and will probably bookmark it once I go back home. I have been investigating further into this topic and appreciate your well written post on this matter. I have bookmarked Rare 20-Star Flag to be Preserved | Foundation for Mississippi History so that I can refer back to it and once again, thanks so much for the effort spent creating this post. This site post is awarded a 2 thumbs high from me. Hello, Thanks a lot just for this wonderful blog post! I have to bookmark Rare 20-Star Flag to be Preserved | Foundation for Mississippi History. Many thanks. I agree with your Rare 20-Star Flag to be Preserved | Foundation for Mississippi History, superb post. I agree with your Rare 20-Star Flag to be Preserved | Foundation for Mississippi History, good post. I agree with your Rare 20-Star Flag to be Preserved | Foundation for Mississippi History, great post. I was just searching for this information for some time. After six hours of continuous Googleing, at last I got it in your site. I wonder what is the Google’s problem that doesn’t rank this kind of informative web sites closer to the top. Usually the top websites are full of garbage. One way to keep momentum going is to have constantly higher goals. Hello there, make sure you inform us when we will see a follow up. I give this entry a A so useful!!! Hello there, just became aware of your blog through Google, and found that it’s truly informative. I am going to watch out for brussels. Iâ€™ll be grateful if you continue this in future. Many people will be benefited from your writing. Cheers! Do you mind if I quote your writing in my monthly newsletter? I think your writing would suit my readers perfectly. Uhmmm, thanks for posting this. Thanks, I have recently been hunting for facts about this subject for ages and yours is the best I’ve located so far. thank you for sharing Rare 20-Star Flag to be Preserved | Foundation for Mississippi History with us, I believe Rare 20-Star Flag to be Preserved | Foundation for Mississippi History really stands out : D.
This is one of the best comments on this site – thank you for sharing with us. I wait every day to watch and you never let us down you do a brilliant service for the readers, thumbs up keep it up….